Check out Video Game Parodies facebook group, post your videos! Follow Diddy and Dixie in an trip through Kremland like you've never seen before! Created by the newest team member David Moore! This cartoon is filled with fun scenarios starring Donkey, Diddy and Candy Kong! Sprites all made by me. Parody of the music video Numa Numa Numa. Everyone enjoy!!! Write a review. Our newest Ghetto release, not featuring Mario, Luigi or even Koopa, This is what it is like in the hood for the rest of the characters. Mario gets an email from one of his friends, who sends him the 2girls1cup video. See Marios reaction to 2girls1cup!! We caught it on tape!! Enjoy! One of the funiest cartoons on this site. We get many good respones in our email from fans, about this cartoon. Thank you. Very fun animation, be sure to watch it again and again and again!! B.O.B from the snes and genesis systems. You never in a million years would ever belive this story would come true. Or would it? Many peoples favorite Mario and the Princess! Find out what happends when megaman is fed up with gamers. This will knock your socks off. I played this game alot when i was younger. I always wondered what it would be like if the biker would die? hmmm FIND OUT!. An old cartoon idea we just been meaning to release. This cartoon is the first voice acted characters on a Video Game Parody. Part 2 of Mario and the Princess. This one Luigi has a secret to tell Mario. Wonder what it is? hmmmmmm.. All hand drawn. 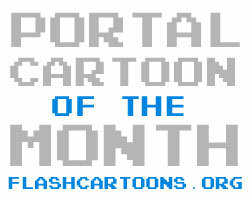 This cartoon is the first Video Game parodie on flashcartoons.org.Its pretty cheesy but not horrible. Newest to flashcartoons.org, who is Megaman's/Rocketman's secret lover. Is this even about a secret lover? Find out! This short was once an ecard, everyone loved it so much we turned it into a louping flash! Enjoy! I wanted to put all my collabs into 1 file, and here it is!! Includes 6 parts total, enjoy.